GRETNA – A local hospital is being sued by a woman who allegedly broke her hip due to medical malpractice under its care. Virginia C. Roppolo filed suit against Jefferson Parish Hospital Service District No. 2 and East Jefferson General Hospital in the 24th Judicial District Court on Oct. 8. 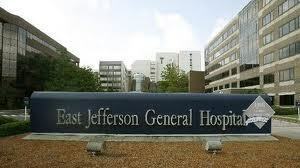 Roppolo asserts that she was undergoing a psychological evaluation as a patient in East Jefferson General Hospital on July 13, 2009 after previously being diagnosed with dementia and being brought into the hospital due to increased hallucinations, confusion and agitation. The plaintiff claims that when she was hospitalized she was considered a fall risk, but was allowed to fall while in the care of the defendant's staff. Roppolo alleges she broke her hip in the fall and had to undergo surgery to repair the injury. An unspecified amount in damages is sought for physical pain and suffering, emotional pain and suffering, permanent damage, physical therapy, occupational therapy, permanent scarring, mental anguish, medical expenses, loss of duration of life and loss of quality of life. Roppolo is represented by Lawrence J. Central III of New Orleans-based Martzell & Bickford.